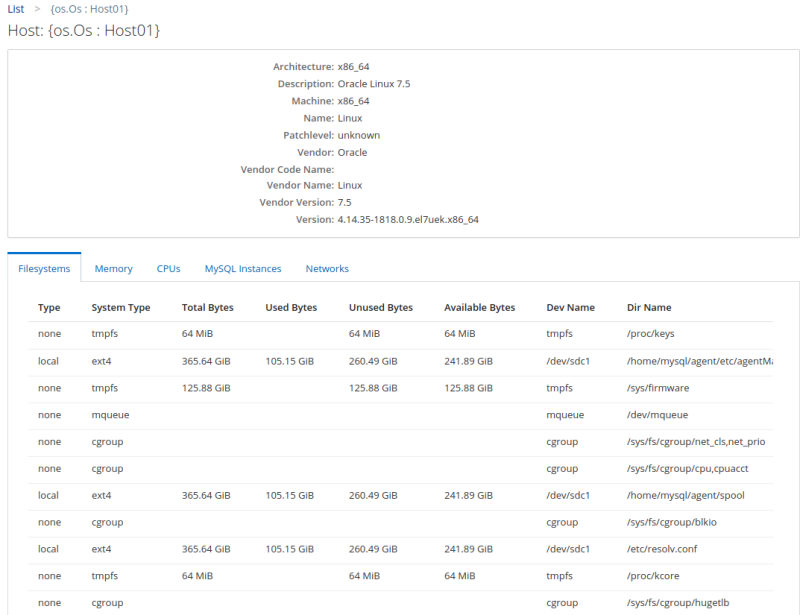 The Hosts configuration view enables you to view all currently monitored hosts and their configuration. To view the monitored hosts, select Hosts from the Configuration section of the navigation bar. The hosts are displayed on individual lines, with brief summaries of their current status, number of instances installed, and information on their operating systems and hardware. The host names are displayed on individual lines, with brief summaries of their membership, current status. To view detailed information on the host's configuration, filesystems, and so on, select Details from the more info menu on the right-hand side of each line. It is also possible to delete hosts, using the Delete option. For more information on deleting assets, see Section 16.4, “Deleting Assets”. Filesystems: lists all the file systems available to the host. Information includes the bytes used, bytes unused, file system type, and so on. Memory: lists the total amount of RAM available and the size of the swap file. CPUs: lists the CPUs installed on the host. Information includes number of cores, cache size, frequency, and so on. 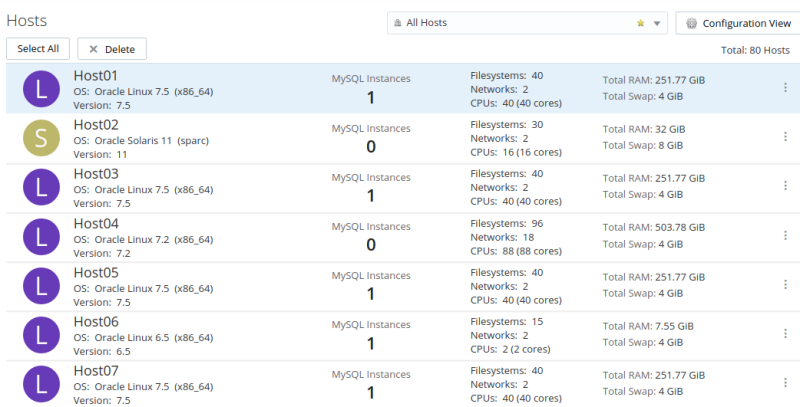 MySQL Instances: lists all the monitored MySQL instances. Information such as the version, status, uptime, and so on. Networks: lists all the network interfaces on the host, their types, names, and so on.